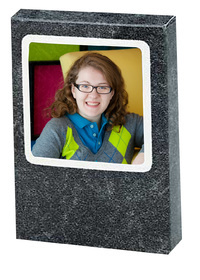 The TAP Marble Memory Mate is a traditional memory mate that holds a team picture, and a larger individual photo. This memory mate will accommodate a 7x5 team picture and a 4x6 individual photo. The neutral gray marble pattern works great for any color team uniform. You can coordinate the TAP Marble Memory Mate, with the matching Marble Folder and Marble Panel Mount. Don't forget to complete your photo packaging by adding foil imprinting with your studio die, and the name and date of the sports team. Memory Mate has a pull out stand on back. Customers who purchased a TAP Marble Memory Mate also purchased these items. Rate our Marble Memory Mate.